Since one of my regular features on this blog is my Netflix Instant Pick, I felt obliged to weigh in on the Netflix pricing controversy. In case you’ve been living under a rock for the past 24 hours, Netflix raised its prices yesterday. I was previously enrolled in the package that lets you stream as much as you want, and borrow one DVD at a time. The old price was around ten dollars a month, and now I’ll be paying another $6 a month for the same service. As you can imagine, customers took to the Internet to complain. The topic #DearNetflix was trending on Twitter most of the day yesterday. Maybe it still is, but I haven’t had time to take a look and see. If you’re feeling brave, you can click here to read the complaints. Maybe it’s just because I’m an old fogey, but I wasn’t mad the price increase. I think the reason I wasn’t angry is that the day before prices went up, I saw this article on CNN that discussed the upcoming contract renewals for Netflix’s licensing of streaming content. After reading that article, I was worried that Netflix would be unable to generate enough revenue to keep the movies that were already available for streaming, let alone add new ones. Once I read that article, I knew that price hikes were inevitable. I don’t think that Netflix is too costly, anyway. 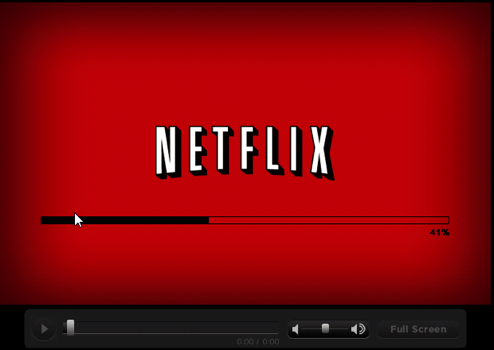 I remember last summer when I first moved to Austin from Phoenix, I didn’t have Netflix at first. I was going through a phase where I was obsessed with getting caught up on the TV show Fringe, so I went to the local Blockbuster. I rented 3 DVD’s and it cost me FIFTEEN dollars! After that gouging, I found out that Netflix was much cheaper at ten dollars a month. I’m not upset about paying fifteen dollars a month for unlimited DVD’s and streaming. It’s a small price to pay and there are no late fees. Of course, to today’s entitled gotta-have-it-now generation, paying for music, movies and TV is an unheard of horror. Yes, you can pirate everything if you’re determined not to pay for it. 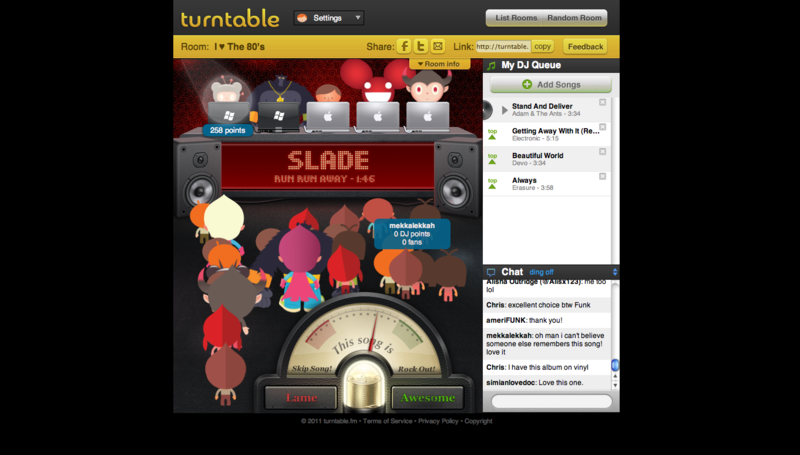 I’ve seen with the music industry how things can end up when piracy takes over, so I pay for all of my music. I don’t want the same thing happen to the movie studios. If you want to blame anyone for being “greedy” you should blame the studios who are asking Netflix to pay them more money so that they can license their content. Netflix is not the one who asked for more money, the studios are. And if you were surprised that this happened, then you are in for a shock if you ever leave your house, because apparently you live in a bubble. If you compare the price of Netflix to the cost of going to the movies, renting videos elsewhere, or renting/streaming movies on iTunes or Amazon, you will soon see what a bargain it is. Yes, it’s STILL a bargain. Stop whining and take a minute to think about the fact that if you are complaining about this, you’re probably living in a fantasy world. Everything has a price, and the cost of Netflix is still less than one night out at the movies, for the most part. This entry was posted in Movies, Opinions/Rants, TV and tagged entitlement, netflix, netflix price hike, rants, streaming on July 13, 2011 by mekkalekkah. Easter is late this year, on April 24th. That means there is even more time to enjoy the delicious Easter candy that only comes around once a year! Because a blog is basically a chance for me to force you to read my opinion about everything, I am going to tell you what I think of some popular Easter treats. This is strictly my opinion. I have a lifetime of experience having a sweet tooth, so I think my opinions are pretty valid. 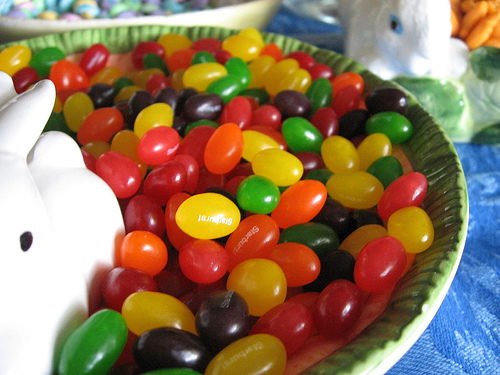 Jelly Beans are an abomination. They are the worst candy ever created, and I hate them. The only good ones are the orange ones, and even they aren’t that great. They have a mealy texture, they have weird flavors (the black ones are terrible), and worst of all, NO CHOCOLATE. If it doesn’t have chocolate, then it’s crap! If I saw this in my Easter basket I would throw them away. Therefore, I give Jelly Beans a 0 out of 10 rating. Peeps are fun to try out once a year. They are cute, adorable, and they look great. However, once you take a bite, you realize that cute isn’t going to cut it in the taste department. 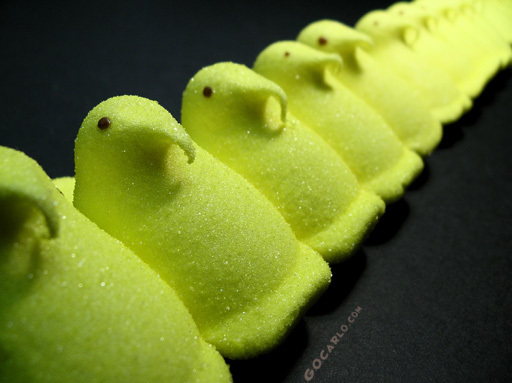 Peeps are too sweet, and yet they are bland at the same time. It has come to my attention that there are now Peeps that have chocolate on the bottom, so I might like those a lot more. I can eat one or two of them before I have had enough, so I’ll give them a 3 out of 10 rating. I love Reese’s Cups, they are perfect. Especially if you get one right out of the freezer, and eat all the chocolate off of them first. 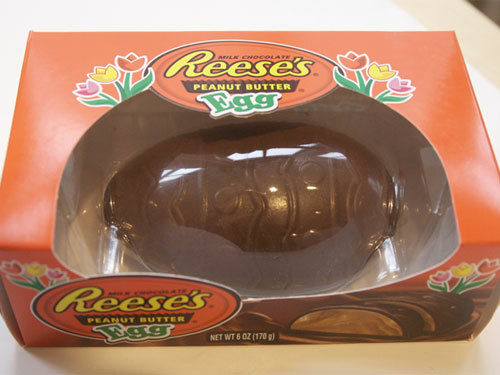 The problem I have with the eggs is that the peanut butter/chocolate ratio is way off. There is way too much peanut butter. I am not a huge peanut butter fan, so a little goes a long way. (Have you figured out that I was a picky eater as a child yet?) I am going to rate these as a 6 out of 10, but the regular peanut butter cups are an 8 out of 10. 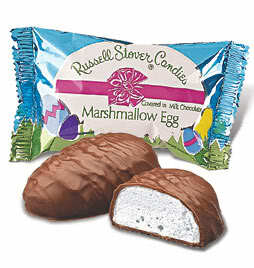 If someone gives me Russell Stover candies at Easter, then I know that they either don’t know me well or don’t love me. Russell Stover candy is horrible, and even if I got it for free, I would not eat it. I swear to God that it’s made of old shredded cardboard, insulation and boot scrapings. Never marry anyone who gives you this candy. My rating is 1 out of 10 because I will eat the coconut filled candies. Cadbury is the best chocolate in the world. Yeah, I know, there are people who swear by those European chocolates, but to me, this is the best. 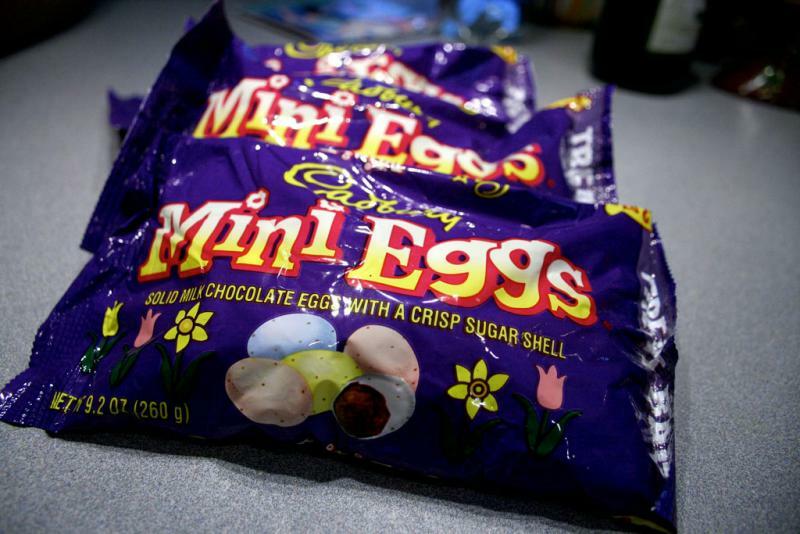 Cadbury Mini Eggs are so great. They are better than m&m’s because they are bigger. The candy shell is crispy and sweet, and the chocolate is rich and velvety. It’s not too rich, though, which means I can eat most of the bag in one sitting. (Oops!) I will rate this a 9 out of 10 (minus one because they are too addictive haha!). 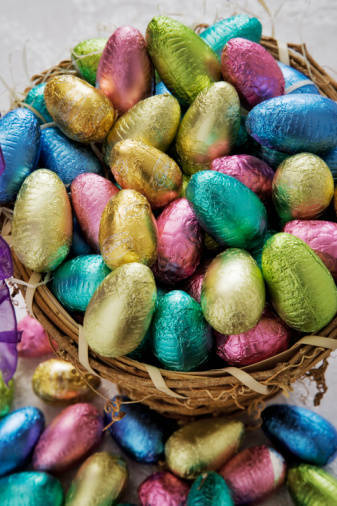 I know that I’ve sounded like a chocolate snob, so here it goes – I love cheap, crappy foil-covered chocolate eggs. The cheaper the better. I would rather have the really nasty ones than the Dove eggs. I think this is because when I was a child I ate a ton of these and so it takes me back to my white trash, suburban, insulated childhood. (Why anyone would be so nostalgic for a time they were so miserable is beyond me.) I also love that cheap chocolate gelt at Christmas (I know it’s a Hannukah candy but I was raised Catholic by a Jewish mother). I will rate these a 7 out of 10 but no one would agree with me. I used to love the cheap chocolate bunnies, too. Then I tried a chocolate bunny from See’s candies. It was SOLID. I had always had the hollow kind (my parents were poor). 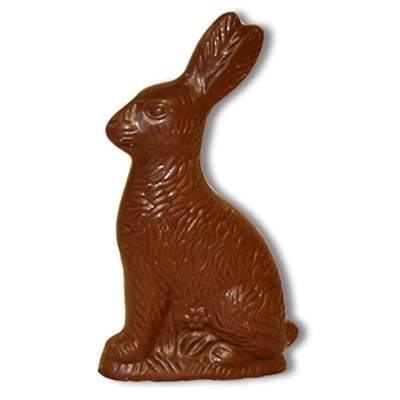 Having a solid chocolate bunny transported me to a whole new level of Easter chocolate enjoyment. Once you go solid, you can never go back. Solid bunnies get a 10 out of 10, hollow bunnies get a 4 out of 10. Cadbury Caramel Eggs? No, too typical. You can get chocolate and caramel anytime. Cadbury Orange Creme Eggs? HELL NO. Too sweet, and it doesn’t even taste like an orange, it has that artificial flavor. 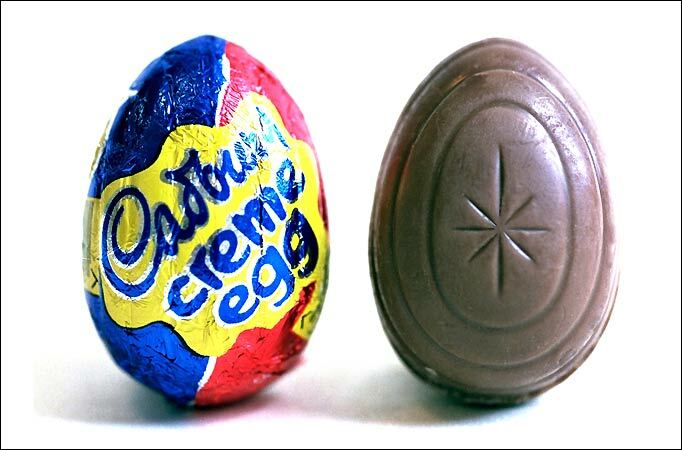 Cadbury Creme Eggs? YES, YES, YES!! I realize that it’s just chocolate and fondant, but it’s just SO HEAVENLY. I love to freeze these so the fondant isn’t goopy. Then I eat the chocolate all around the fondant, saving the “yolk” for last. Most people I know who hate Cadbury Eggs think they are too runny and goopy, so try freezing them and let me know what you think. I will rate these 10 out of 10 forever and ever, Amen. This entry was posted in Opinions/Rants and tagged cadbury eggs, cadbury mini eggs, chocolate bunnies, easter candy, jelly beans, peeps, rants, reese's peanut butter eggs, russell stover on April 6, 2011 by mekkalekkah.